It’s been 14 years since Germany last placed in Miss Universe semis. 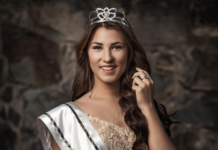 This year, the country is banking on pageant veteran Johanna Acs for the chance to finally bring Germany back to the pageant map. Johanna, 24, previously competed in Miss International 2010 in China where she placed in the Top 15. Since then, she also competed in other international pageants before she won the Miss Universe Germany title last year. Get to know more about her and her preparation for the upcoming competition. Due to the fact that my biggest passion is traveling, I am very open minded and have traveled around 50 countries in my life. I want to see the world in its great diversity and experience not only touristic places, but also uncommon and neglected areas of the world – e.g. this year I have traveled to Haiti and Burkina Faso to see circumstances with my own eyes. For longer periods in my life I have lived in Indonesia, Hungary and America besides Germany. I am studying Textile and Clothing Management and I received a scholarship to study one semester of “Logistics and Procurement” in Indonesia last year. If you think Germans are always on time, direct and love to drink beer – then you are definitely right. Germans like rules, organization and structure and by far football is the most popular sports in Germany. Car manufacturing is of large importance and the fact that there is no speed limit on many highways attracts a lot of speed enthusiasts. Germany offers vibrant cities which all differ from each other and are unique in their very own way. The capital Berlin convinces with its diversity of nations, lots of museums and its historic structures such as the Brandenburger Gate and Reichstag. Other cities that are a must to visit during a trip to Germany are Munich, Cologne, Hamburg and Frankfurt. We have breathtaking landscapes such as the Bavarian Alps, the Black Forest, the Rhine or the Baltic Sea. If you want to experience something fun you should attend the Carnival in Cologne which is one of the most celebrated events in Germany and full of colorful parades, costumes and happy people. In case you love beer and want to experience the world’s largest folk festival, you should visit ‘Oktoberfest’ in Munich. I heartily recommend everybody to visit Germany because the culture, history, art, music, food and nature enriches every tourist that visits and makes them want to return. Moreover Germany gives me so many reasons to be proud of my country! It’s an economically and socially well developed country and offers a high quality of living. Germany is world leader in many different areas of technology, innovation and engineering ranging from cars to consumer products. It’s probably not a very special beauty secret, but I drink enormous amounts of water! I really love water!! Another healthy thing that I actually love are avocados! I mix avocados with everything – wraps, smoothies, salads, on bread, pasta etc. It’s filling, very healthy and tastes so delicious. What are your preparations for Miss Universe 2016? My boot camp for Miss Universe took place in Los Angeles because I had to fit my evening gown and national costume over there. I watched the Miss California USA Miss California Teen USA pageant in which around 400 girls competed for 2 days. Watching and analyzing the girls was actually a helpful part of my preparation. I did some training on my catwalk and I am still going to have some catwalk classes with a Brazilian dance teacher. Moreover I did some practice on my QA to feel more secure about any question. I watched the Miss Universe preliminaries and finals of the last five years, which was also very helpful to see what is going to expect me. Nevertheless, I think no matter how much I prepare for Miss Universe 2016, I am always going to feel like I could prepare even more! Since when you were interested in beauty pageants? I love beauty pageants since I am a little girl. I always watched them in TV and dreamed about representing my country once that I am old enough to do so. There is just something about beauty pageants that always fascinated me! What was the biggest challenge you faced in life? What did you do to overcome it? When I was 15 years old, I was a shy girl and not really confident about myself. I was wondering about what could be the biggest challenge for me in order to become more mature. Therefore I packed my bags and left my comfort zone in Germany started a High School Year in Kansas, America. Back then, it was a cultural shock because I lived in a tiny village having 1400 inhabitans in the middle of the cornfields with basically nothing around. Not just did I become more mature and self confident, but also very open minded and multicultural. I am proud of this stage of my life because it helped me to become the person I am today. Probably the same things that I am doing right now! My actions are not based on the fear of punishment, but on what is morally the right thing to do! Tell us about your mantra or secret to success. My biggest secret to success is ambition and perseverance! I am a very ambition person and if I really want to achieve something, I don’t give up easily, but I am willing to work hard for it! I didn’t win Miss Universe Germany on my first attempt, but I worked hard on myself and with the help of ambition and perseverance I was able to fulfill my big dream! Pia Wurtzbach who won her national title only after competing three times and then won the whole Miss Universe pageant truly has been in inspiration to me! I am convinced of the fact that the most important thing is to believe in yourself and the rest will follow. My life motto is: “Go to bed with a dream, wake up with a purpose”. What qualities do you think will enable you to shine at Miss Universe 2016? I think the most important quality is to completely be yourself and to be proud about that! During Miss Universe I don’t want to pretend to be someone else, but just show the world the pure natural “me”. I hope that my honest smile and personality will make me stand out and shine! I wholeheartedly send out kisses hugs and a huge thank you to everyone who supports me on my journey to Miss Universe 2016! It truly means so much to me and every sweet word will make my day and give me more power! I can say that I don’t take any support for granted and that I am just grateful for this incredible experience in my life.